Yes, I know. Every time I talk about the innovative electronic features that auto and truck makers are putting into their vehicles, you tell me that you are already smartest, safest drivers out there. But, if a new vehicle is in your future — especially a new truck — you should know what’s out there to protect you from all of those other bad drivers who threaten your well-being. You’ve heard about those autonomous driving vehicles that will assure a driverless future. (Don’t hold your breath.) These are some of the assistance systems that will make that possible someday. And, remember, driverless cars and trucks will require some major changes to our infracture so don’t be looking for them, except in very limited areas. This is not about vehicle brand, although the image is from General Motors. Most manufacturers have developed or are developing variations of these features. They are often part of a safety and security package and I think they are worth it for a new 2014 or 2015 truck or car that you plan to keep for a long time. 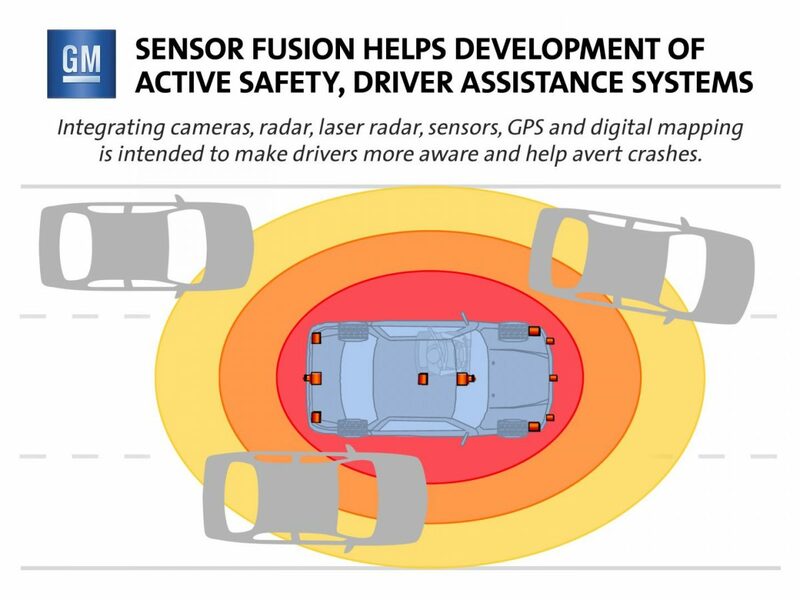 Forward-collision warning systems: Let you know when objects like semi-trucks, are in front of a vehicle and alert you to a possible collision. Some offer automatic slow down or braking if you are not quick enough on the brake pedal. Lane-departure warning systems: Distractions and other situations can make allow you to drift into another lane. This system lets you know when you are not in your lane either by rumbling your seat, providing a visual cue like a light or an audio alert. Sometimes a combination of these are employed. You would be amazed how often this happens. Lane-keeping assistance: An in-law of the lane-departure warning system, this feature applies a small amount of steering help to encourage your vehicle to stay in its lane. It is especially helpful if you are towing. Adaptive cruise control: If you have ever found yourself driving in cruise control and coming up on a vehicle in front of you, this feature is for you. It is designed to maintain a safe distance by applying a bit of braking when you need it. Again, this is a gang-busters feature when towing. Blind-spot detection systems: There is always an ugly feeling when that little car in your blind spot sits on the horn when you have just about crushed him while changing lanes. This feature lets you know, in plenty of time, when anything is in your blind spot. Again, a great feature when you are towing. Cross-traffic and pedestrian alert systems: These will tell you when pedestrians, cyclists, or vehicles are crossing in front of your vehicle. If you have ever seen a T-bone crash, or even a photo of one, you know how valuable this feature can be. The last of the high-tech features will probably never make it into a truck, but one never knows. You may want it on your other wheels, particularly if you or a family member isn’t great at parallel parking. Parking assist is amazing. You put the car into the proper position and let the feature do the rest. Yes, it parks. Without you ever lifting a foot or a finger, your parallel parking posture will be perfect. I liken it to automatic hill descent on a truck. What a world!